The mischievous Cheshire cat is a classic character who has had numerous renditions over the years. From the original Tenniel illustrations, to stage plays, animated films and live-action films; the Cheshire Cat continues to grin his way into people’s hearts. 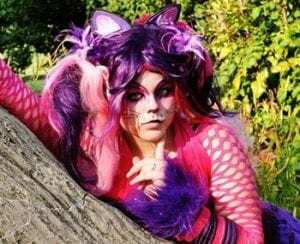 Whether you think he is cute or you are simply trying to find a costume for Halloween, here is a review of the best Cheshire Cat costumes for the different age ranges. The Cheshire Cat Infant costume draws its inspiration from the 2010 Tom Burton movie—Alice Through the Looking Glass. Because of this particular point of reference, the costume’s color is not the well-known pink and purple stripes. Instead, the costume recreates the look from the movie by incorporating a soft gray and blue. The costume consists of three pieces—a bodysuit with attached mitts, a hood and a tail. The bodysuit is long-sleeved, and it fastens with Velcro at the center back and at the crotch to facilitate the easy change of diapers. The attached mitts can flip back to expose the hands whenever it is warm and completely cover the hands whenever it is cold. The tail, which is an important aspect of the Cheshire Cat costume attaches at the back with Velcro. That means you can quickly remove the tail if it makes your toddler uncomfortable. The hood also fastens with Velcro under the chin. The hood keeps your toddler warm when it is cold, and the printed eyes and sculpted ears on top add cuteness. While the bodysuit does not come with socks, you can purchase grey socks to complete the look. There are other accessories you can add if you wish to. However, that is not necessary because the Cheshire Cat Infant costume transforms your little one into the perfect embodiment of the Tim Burton character. An added advantage is that you do not need to wait for particular events such as costume parties to dress up your son or daughter in this costume. It is a versatile costume that your little one can wear anytime and anywhere. The costume comes in two sizes. The 6/12 for the 6-12 months’ infants and 12/18 for 12-18 months’ infants. The costume is made from 100% polyester velour fabric and is therefore durable and of high quality. The costume doe nor impede diapering. The costume does not cover an infant’s legs and hence might not be appropriate for cold weather. The Cheshire cat might be the chief mischief-maker in Wonderland, but he is also incredibly cute. It is therefore not a stretch that you might want to dress up your little one in a Cheshire cat costume every once in a while. The Big Girls’ Cheshire Cat Jumpsuit allows you to transform your little one into a cute Cheshire Cat during Halloween, costume parties or just a quiet night at home. The costume is made up of only one item—the jumpsuit. Made to resemble the Cheshire cat, the jumpsuit is pink in color with purple stripes. It has a zipper in front for closure and elastic bands around the wrists and ankles to keep the jumpsuit in place. The suit has a fluffy tail attached at the back. The tail is a hit with most children because they can spend hours playing with it. The final detail on the costume is the attached hood. The hood is designed to capture the Cheshire Cat’s ever-grinning expression. It has a plush cat head complete with a broad grin, eyes and two pink cat years. Arguably, the hood is the costume’s most exciting feature, and it plays a part in bringing out the cuteness the Cheshire cat jumpsuit is supposed to evoke. The most significant benefit of purchasing the Cheshire Jumpsuit for your little one is that he/she can wear it around the house even when there is no particular event going on that requires the wearing of costumes. The reason for this is that the costume is warm, it is cute, and it looks good. The jumpsuit comes in four distinct sizes. The extra small size is for three to four-year-olds. The small size is for five to six-year-olds. The medium size is for seven to eight-year-olds, and finally, the large size is for nine to ten-year-olds. The suit is made from 100% polyester and is, therefore, durable and of high quality. The costume can accommodate multiple accessories such as a Cheshire cat mask or Cheshire cat ears. Designed with teenage girls in mind, the Teen Wonderland Cat Costume is sassy, stylish and fashionable. It is made up of six pieces—a dress with an attached tail, an ear headband, wrist covers, a shrug, a choker and thigh-high stockings. The dress is a pink and purple striped jersey dress with adjustable shoulder straps to ensure your teenager can play around with the dress’ height. Detailing on the dress includes a purple broadcloth bodice with pink lacing that ends in a charming bow. The dress’ hemline and neckline are lined with faux fur to inject an element of fun into the dress and also pay homage to the Cheshire Cat. While the dress is already fantastic on its own, it is the accessories that transform this costume into an appealing work of art. The headband is covered with fur and has cat ears sewn onto it. The striped pink and purple wristlets are lined with faux fur while the thigh-high stockings have pink ribbon bows. The shoulder shrug is also lined with faux fur. The final accessory is a leather choker decorated with faux gems. The accessories elevate the look from costume to stylish, and they help transform your teenager into a fashionable Cheshire cat for either Halloween or any other planned event. The costume comes in multiple sizes for teenagers aged thirteen to eighteen. It only requires that you take your teenager’s correct measurements before making an order to ensure the costume fits the way it is supposed to. It is essential to note that a Cheshire cat costume for teenage boys is also available (Teen Cheshire Cat Costume). The only difference is that it does not have as many pieces as the Teen Wonderland Cat Costume and also it is not as detailed. Thanks to the use of 100% polyester when making the dress, the costume is durable and of high quality. The costume is cute, and it appeals to teenage girls. The costume does not come with shoes, and therefore an extra cost is incurred purchasing coordinating shoes. The Cheshire Cat Women’s costume is a cheerful garment that helps adult women embody the comical, mischievous and fun nature of the Cheshire Cat. Drawing its inspiration from the original 1951 Disney animated feature film Alice in Wonderland, the costume is bright, bold and fun. The costume has two pieces—a hooded dress and a pair of mitts. The fact that the costume has only two pieces ensures the focus is on the dress and its tastefully designed details. The dress is a three-quarter sleeve skater dress with purple and pink stripes. That it is a skater dress makes it current and chic. The attached hood is lined with faux fur and has cat ears on top which inject an element of fun into the costume. The costume’s second piece—the mitts—are made from faux fur then detailed with paw pads appliques. The appliqued paw pads not only resemble a cat’s paws; they pay homage to the 1951 Cheshire Cat. To ensure there is cohesion in the garment, the faux fur tail sewn to the back of the skirt matches the pink and purple paw mitts. Pink faux fur boot tops are available as a separate piece at an affordable price. While the boot tops need not be there for the look to be complete, they improve the costume, and it is advisable to consider purchasing them. The costume is available in all the standard adult sizes—small, medium large and extra-large. The costume is durable and of high-quality thanks to the 100% polyester fabric and faux fur. The costume is chic and current. Extra cost for the boot tops and coordinating shoes. Men, as well as women, can wear Cheshire Cat inspired costumes. The Adult Deluxe Cheshire Cat Costume is geared towards adult men. The costume consists of four items—the jumpsuit with an attached tail, the headpiece, paw mitts and paw feet covers. The detailing on this costume is minimal because it is geared towards men and men usually prefer clean designs. However, despite the clean design, the costume still embodies Lewis Carrol’s Cheshire Cat. The striped purple and pink jumpsuit has a sewn-on stuffed tail and a zipper at the back. With regards to the color, the costume honors the Disney animated feature film. The faux fur headpiece has ears on top which help inject an element of fun and mischievousness into the costume. The fur mitts and shoe covers round up the costume. The gloves and shoe covers have attached faux claws to give the appearance of a real cat’s paws. The claws help make the costume more authentic. If you happen to think the costume is too stripped down, then there are recommended accessories you can add. Key among the recommended accessories is cat makeup. Cat makeup ensures your face and the costume complement each other. With Halloween just around the corner, there are numerous cat makeup ideas you can find on the internet to ensure you get it right. The costume comes in the standard adult sizes—small, medium, large and extra-large. The size chart provides a detailed guide on the sizes. Ensure you get your correct measurements so that the costume you order does not end up being too baggy. However, it is important to note that you can quickly make adjustments or improvise in the event the size does not work for you. The costume is comfortable and looks good. The costume is warm and therefore perfect for cold Halloween weather. At first glance, the costume appears too simple. With the information herein, you now know the top-rated Cheshire Cat costumes for all age ranges. However, there are three things one ought to consider before purchasing the costume. Lewis Carrol’s character the Cheshire Cat is the source of inspiration for the Cheshire Cat costumes. However, over the years, multiple movies and plays that have brought this character to life. It is essential to determine the costume’s source of inspiration before purchase. 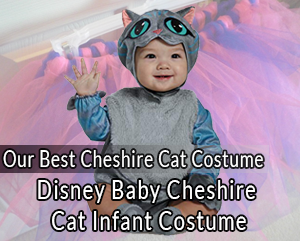 For example, the Disney Baby Cheshire Cat Infant Costume mentioned above pays homage to the 2010 movie. If instead, you wanted an infant costume inspired by the 1951 feature film, then this costume is not for you. Knowing the source of inspiration will help you determine if that is the actual costume you want or whether you prefer another one. Fitting is always important for any costume purchase. It is crucial that one goes through the size guide to determine the right size and avoid disappointments. Go a step further and read any sizing tips offered. The Cheshire Cat costume is not complete without makeup. While makeup is not a necessity, it helps improve the look and plays a significant role in helping you embody the character entirely. There are numerous tutorials and videos on how to get the Cheshire Cat makeup right. Take a moment to go through them and then follow that up by purchasing the makeup. Cheshire Cat accessories are too many to list. The accessories add style to your costume and guarantee you will stand out even when surrounded by numerous people donning the Cheshire Cat costume. Some Cheshire Cat accessories include; a Cheshire Cat wig, Cheshire Cat shoes, Cheshire Cat headband and tail. After going through the five best Cheshire Cat costumes, the only thing left to do is make the actual purchase. The above guide has made sure you can purchase the best possible costume not just for yourself but also for your child and your partner.